Graduate of Willard High School. Graduate of the Ohio State University College of Dentistry in 1986. 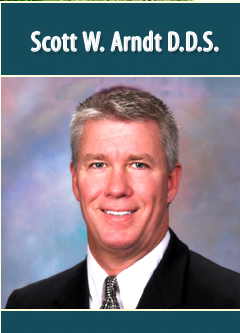 Scott W. Arndt grew up in Celeryville, Ohio and is a graduate of Willard High School. He completed his education at the Ohio State University College of Dentistry in 1986. He continues to participate in post-doctoral dental continuing education courses. Today, Dr. Arndt lives in Westlake with his wife, Marie, daughters, Adrienne and Meredith, and son, Michael. When he is out of the office, the doctor enjoys spending time with his family, working in his yard and rooting for his Cleveland sports teams. Dr. Arndt has won recognition as "Cleveland's Best Dentist"! in 2013, 2014, 2016, 2017 and 2018. Cleveland Magazine awarded him with a full profile in the October 2016 issue of '"Cleveland's Best". Click here to read his profile and find out why he is the "Best of the Best"!